Providence-based Deepwater Wind continues to invest in the areas of New Bedford and Fall River while embarking on other projects across the Bay State, including a mountain-lake power plant in western Massachusetts. The owner of the Block Island Wind Farm has announced it will choose Somerset, Fall River or New Bedford to host a facility for building 24 wind-turbine foundations for its Revolution Wind facility proposed in a federal wind zone between Block Island and Martha’s Vineyard. If approved, Revolution Wind would start construction in 2022, according to Deepwater Wind. In all, the offshore wind facility is projected to inject $300 million into the regional economy and create 2,300 jobs. Three hundred employees would be employed at the yet-to-be-named site for turbine foundation construction, where workers would weld, fabricate and paint the 1,500-ton steel structures. “This is about building a real industry that lasts,” Deepwater Wind CEO Jeffrey Grybowski said. In a recent radio interview with 1420-AM (WBSM), New Bedford Mayor Jon Mitchell said the number of jobs promised is too low for the size of the site needed for the foundation work. Mitchell said Deepwater Wind is looking for about 100 acres. He suggested that the 307-acre site of the former Brayton Point power plant in Somerset might be better suited for the work. New Bedford is already expected to receive some of the economic benefits of Revolution Wind and other proposed wind projects. The 26-acre New Bedford Marine Commerce Terminal will host construction and staging work for Deepwater Wind's latest project and the Bay State Wind and Vineyard Wind renewable-energy facilities. Deepwater Wind is also seeking proposals from local shipyards to build special boats that ferry employees to its offshore wind facility. Some 12 employees would operate the vessels during the 20-year-plus life of the Block Island Wind Farm turbines. Similar boats would be built for Deepwater Wind’s other projects in the wind zone in the waters between Massachusetts and Rhode Island. The 21-meter Atlantic Pioneer was built by Blount Boats shipyard in Warren, R.I., to transport crew and supplies to and from the Block Island Wind Farm. Revolution Wind is the first offshore wind project to take advantage of 2016 Massachusetts legislation that calls for 1,600 megawatts of offshore wind by 2027. Revolution Wind is billing itself as an energy source that can deliver electricity when needed, even if the wind isn’t blowing. A lack of electricity from the proposed 400-megawatt wind farm would be substituted by a 40-megawatt-hour battery storage system designed by Tesla. It will also take ownership of electricity from a hydroelectric “pumped storage” system in Northfield, Mass., some 115 miles from the South Coast. There’s no dam. Instead, a manmade lake atop Northfield Mountain drains into a generator within the mountain. The 50-year-old facility requires more energy to refill the 5-billion-gallon lake with water than it produces. But the 1,168-megawatt energy facility, owned by FirstLight Power, makes money by using electricity for its pumps during off-peak hours, when prices are lower, and selling it to the grid when electricity prices are higher. The hydro facility also provides on-demand power, so it's a suitable partner for a wind facility that periodically stops spinning. Revolution Wind, therefore, could join fossil-fuel power plants as a baseload energy generator that can be turned on and off based on electricity demand. “Revolution Wind will deliver ‘baseload’ power, allowing a utility-scale renewable energy project for the first time to replace the retiring fossil fuel-fired power plants closing across the region,” according to Deepwater Wind. The Northfield Mountain Generating Station is waiting for its federal operating license to be renewed. In February, Environmental Protection Agency administrator Scott Pruitt made a surprise visit to the pumped-storage facility, which draws its water from the Connecticut River. Pruitt was joined by a member of the Federal Energy Regulatory Commission, the entity that decides if Northfield Mountain will get relicensed. Pruitt gave no comment on whether he supported the power facility and was criticized for not meeting with local officials and environmentalists who support the power facility. Deepwater Wind is partnering with Nation Grid Ventures, a division of National Grid the utility, to build a a network of undersea power cables that would connect Revolution Wind and other offshore wind facilities to the electric grid. 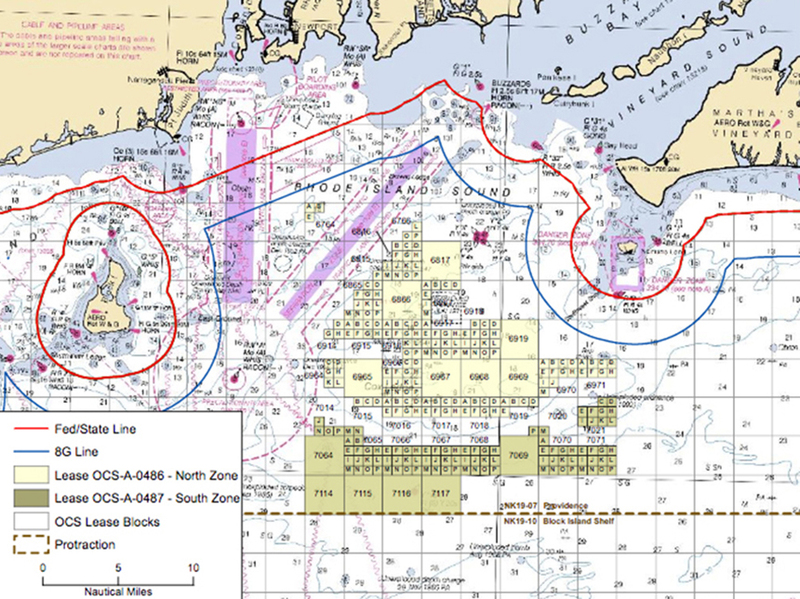 If approved, the project would speed up the approval and licensing of other wind facilities by having an existing network of transmission lines to tie into within the Massachusetts and Rhode Island offshore wind zone.